redemption of the race packets for the condura run for the dolphins 2010 started this afternoon at the vacant lot in front of ROX, and although i had pencilled this in on my moleskine planner for friday, i decided to pop by bonifacio high street to see whether we would see a repeat of the nightmare that was the adidas KOTR 2009 race kit redemption last year -- i've only heard stories of it, but most of what i heard was not good. 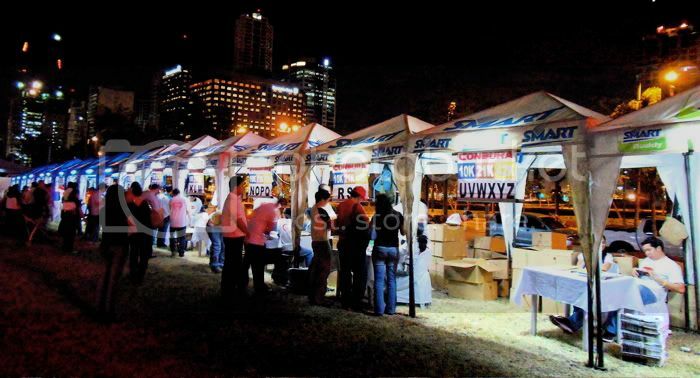 when i began joining road races back in 2003, race packets were usually claimed on the day you register, but providing a short window for claiming the kits at a given venue has many marketing benefits alongside the huge logistical challenge. when i joined the singapore marathon in 2008, a running expo was ongoing at the claiming area, and the sponsors had a captive audience. condura run's sponsor asics put up an expo of its own, selling top caliber running shoes at discounts between 10 and 40%. i just got me an asics gel-kayano 16. but aside from the 30-minute test run i put them through earlier, these babies aren't seeing real action anytime soon. why? 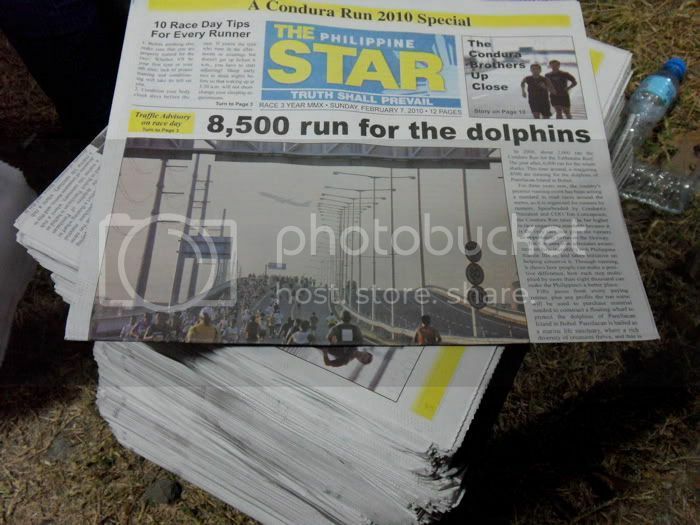 well, because i've decided not to run the condura run for the dolphins 2010. i've decided to photograph it. 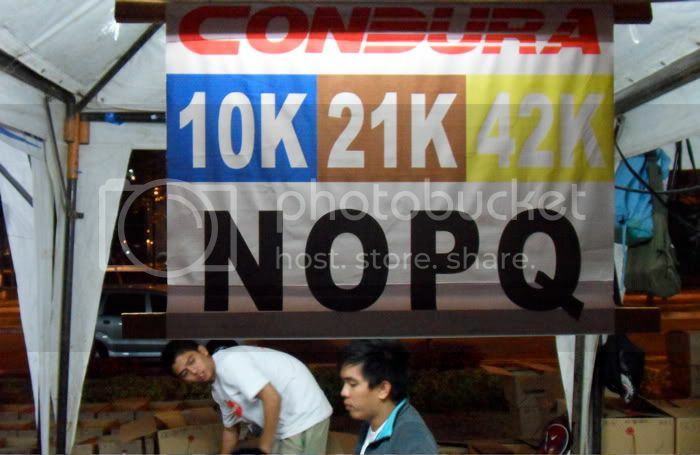 at the condura run's redemption center, i saw ton concepcion himself. we'd been exchanging emails and he even left a message on my blog after he stumbled upon it last year and saw the "inspiring" photo that is nearly as famous as the run itself. i introduced myself and he was delighted to meet me: i couldn't believe it. he thanked me for sharing that photo with the run. but i was more thankful that they'd put it up on a billboard in EDSA, and on the frontpage of a special edition of the philippine star! then i joked that my name was a bit too small, and he shared that there was an error inside the special supplement: a photo of him wearing a nike shirt. i couldn't contain my excitement to be speaking to the man behind this very well-received running event, which hinges on an environmental cause, rather than towed by the popularity of a celebrity endorser. he seemed really passionate about the event and its chosen advocacy. ton himself was so humble: he was profuse with gratitude. he even introduced me to his beautiful family. his wife said the photo was amazing. i said i was lucky to be standing where i was when the plane took off from NAIA's primary runway. 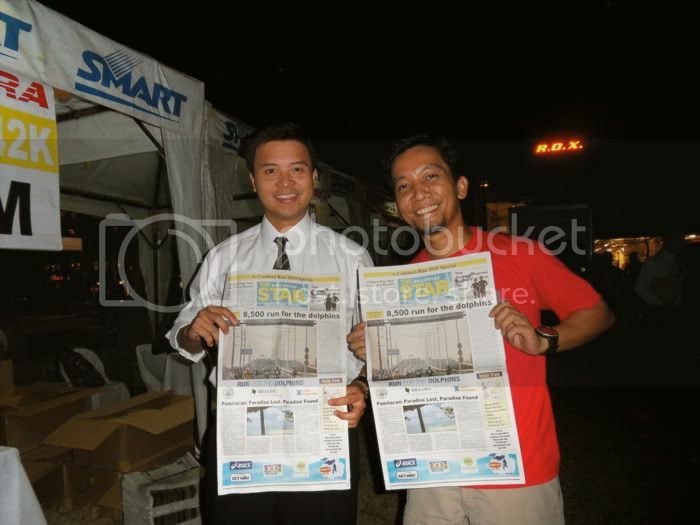 then i was about to say if i could have a photo with him, but he beat me to it: he was already holding his canon G10 when he asked if we could have a photo together with my skyway picture. and then i said: no, can i have a photo taken with you! i'm not a celebrity! the only person who gives me this much importance is myself! haha. and then ton asked if i'd like to get a special pass so i can photograph the entire event. wow, that basically tilts the scale: i'd been weighing the options and thinking about whether to run or to photograph it, and running the event has been winning since i had no assurance i could top the previous photo, but being allowed to take my bike to the skyway to photograph such an important sporting event is a rare chance that i just cannot pass up on. and besides, although i'd put in more than 16kms since monday, i don't think i am prepared to tackle 21k in the time that i've imagined. just not enough kilometrage, i'm afraid. anyway, make your way to the redemption center of the condura run later today and on saturday. there was no chaos when i showed up: it took them less than a minute to find my race packet. 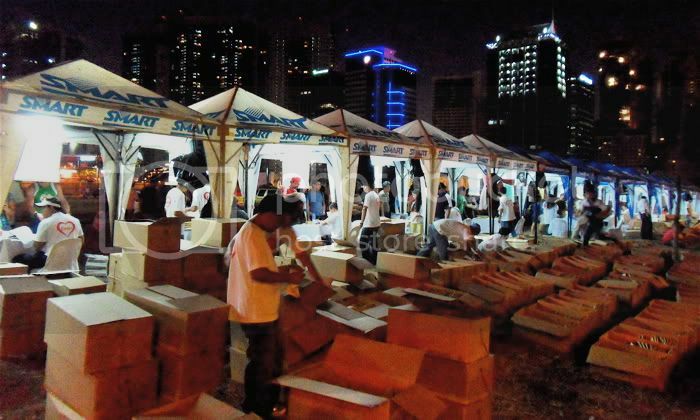 my only concern is if it would rain: i wonder where they'd stuff all those boxes. ton said that they'll put up additional tents later to make the redemption process less painful and maybe even a pleasant experience. don't be surprised if you bump into someone you know. there are more than 15 tents currently. participants for the 3k and 5k events are separated from those running 10k, 21k, and the marathon. 8,500 runners are joining the run, so i suppose there's a bigger concentration on the shorter distances. and don't forget to get a copy of the philippine star special supplement. i took the photo on the front page. who else can say that they're on the cover of a future issue of a national daily? haha. i joked about setting up my own booth so i can autograph copies of the paper. i kept hearing very nice comments from complete strangers about the photo. i'm close to tears, seriously! i actually ran monday, tuesday and thursday, putting in a little above 5k each night. come to think of it, i haven't had more than 5k since BMC! so i really am not up to the task of running a 21k. but at least i'm still losing weight. haha. When are you going to email me a high resolution copy of your picture? hi nathaniel. i'll send you the picture later. at least your running form is plastered all over. i just get a small byline at the bottom. haha. I still haven't received your email, maybe the attachment is too big? Do you have a link where I could download it? Thanks again bro! i received the spread with your photo on the front page (I ran the 3k), and was wowed at first sight. kudos sir! hey thanks. i'm glad you liked it. congratulations on the run!